The Great Dribble Bib Swap! Not content with masterminding Me-Made-May, the lovely Zoe decided to launch a new challenge to be known as The Great Dribble Bib Swap. She was pretty confident that no-one else would have previously nabbed that hashtag on IG! The aim was to connect the parents of new babies with each other through a fairly straightforward and simple project to sew a dribble bib. Obviously I don’t have a baby of my own but we do have The Adorable One in our lives now. No apologies for using this photo again, it is my very favourite thing! Having already invested in an excellent tool for installing plastic snaps to make her some dribble bibs I thought I’d join in. This is the pattern I use – I’ve not shown the whole thing because I appear to have written my mother’s shopping list on one corner! My recipient was Maider who blogs here and posts on IG as @maider_masustak. She lives in Spain and has a little boy. Zoe had posted some inspiration on Pinterest and I was tempted to add assorted embellishments. In the end I decided that practicality is probably the most important thing when it comes to a dribble bib so decided to keep things simple. I didn’t have a large enough piece of suitable jersey fabric so bought a piece from Anna’s (Eternal Maker) de-stash which was leftover from a sample t-shirt now on display in the shop. It’s a lovely soft fabric with a great pirate design. Annoyingly I couldn’t find the nice plush fabric I’d bought for my original foray into dribble bib making and decided to try towelling. I experimented with this but wasn’t 100% happy with the level of softness. I bought a small piece of another plush-type fabric which I felt worked much better and I decided to send both bibs to Maider. I had a message from Maider this morning to say the bibs had arrived and I’ve just seen a photograph of her little boy wearing one on IG. He’s so cute! 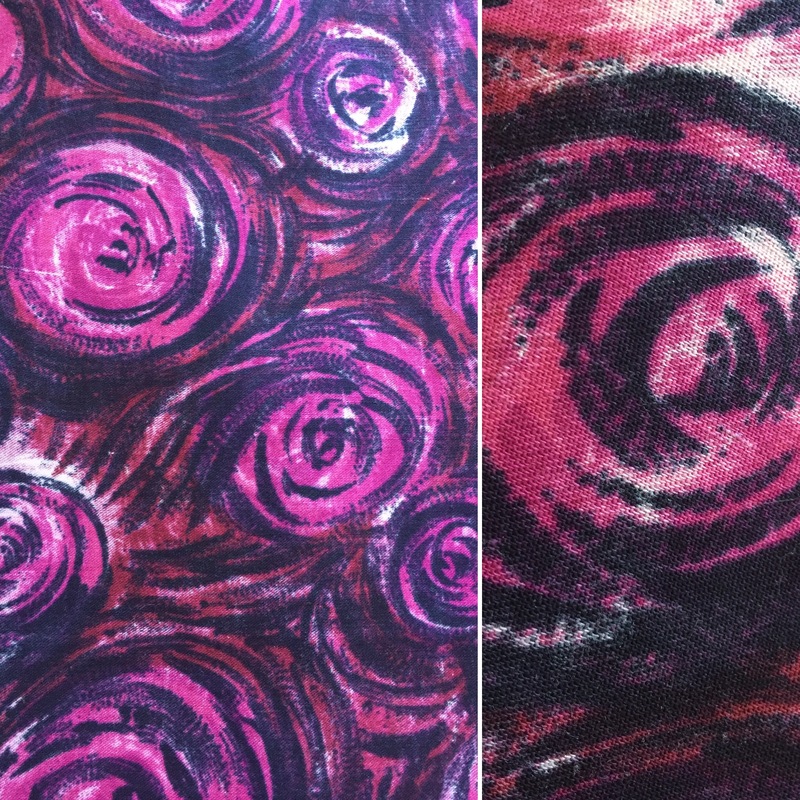 Postscript : when I was sorting out my fabric last night (more of that in a future post) I came across the original plush fabric. Never mind, I’m sure I’ll be sewing more dribble bibs as Miss J starts teething! I’ve got an awful lot of plastic snaps to use up. I know, an unusual time to be reviewing a year, but today is the first anniversary of Mr Jane Makes’ heart attack so I’ve spent a lot of time over the last few days thinking “this time last year”. None of this particular reflection has anything to do with sewing but I just felt I needed to recognise the occasion. Things could have been so different and I’m just thankful that he received such amazing treatment in hospital and, just as important, that he made the decision to turn things around and transform himself. I’m so proud of him. It was a scary time and I have to admit that for the first few weeks I felt very anxious every time I left him on his own and it was even worse once he started going out for walks and bike rides. He has a somewhat cavalier attitude to danger at the best of times so I’ve always been relieved to see him re-appear on his bike (or roller blades) or to get a call at the end of a day’s skiing. The added jeopardy was hard to handle. I have a vivid imagination so living with action man is always going to be difficult! At least now he’s doing all this with a set of arteries that are hopefully no longer in danger of blocking up. One thing I’m particularly pleased about is that he’s now off the blood thinning medication as the above attitude to danger often results in injuries which for the last year have bled profusely over furniture, sheets, towels etc. The final statistics from his new regime were – four stone lost, nine inches off his waist and cholesterol reduced from 6.8 to 2.7. Quite a few people have said to me that they never really thought of him as overweight but these photographs definitely highlight the change in his appearance! The Park Run has been a great addition to his list of activities and although meant to be just for fun – his competitive nature means he’s always chasing a new PB and several of the other runners! I’m there every week to cheer him on – and carry various people’s jackets/phones/wallets but I’m definitely NOT taking up running again! Two other major things have happened during the last twelve months. One horribly sad and one incredibly lovely. 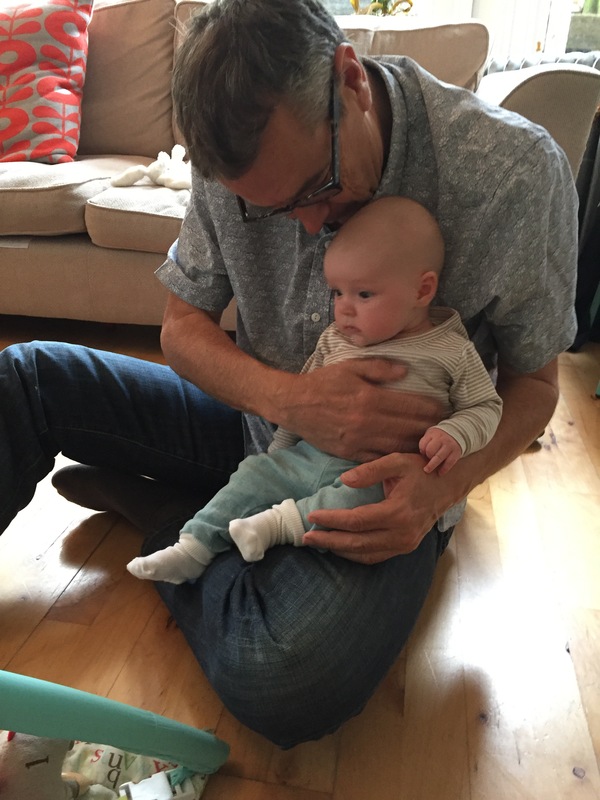 I lost my dad in January and I’m not sure I’ve even started to come to terms with that. However, on what would have been his 87th birthday, Mr J-M’s daughter gave birth to the adorable Baby J which means that this can still be a happy day. Here’s some photographs from our visit yesterday. She is just perfect. There was some amusement at my expense because she looks a lot bigger when I’m holding her! It won’t be long before she’s as tall as me! All the more reason to stay fit and healthy! I’m just so glad he’s still here. Much as I love the sunshine, I work in a 1960s building which is made primarily of glass (with no air con) and on a sunny day my office is like the hothouse at Kew Gardens! We’re also right in the middle of a one-way system so if the windows are open we have to contend with traffic noise and fumes. There are compensations. I have a lovely view of Chichester Cathedral and, provided you can cross the road without incident, we are minutes from the centre of the city. My current wardrobe worked well through Me-Made-May but I’m seriously lacking in suitable clothes for higher temperatures. My two favourite sleeveless dresses are now too big and possibly too much of a fiddle to alter as they are both lined (and I’m a bit lazy). I’ve not decided what their final fate will be. I needed to sew something new, and quickly. 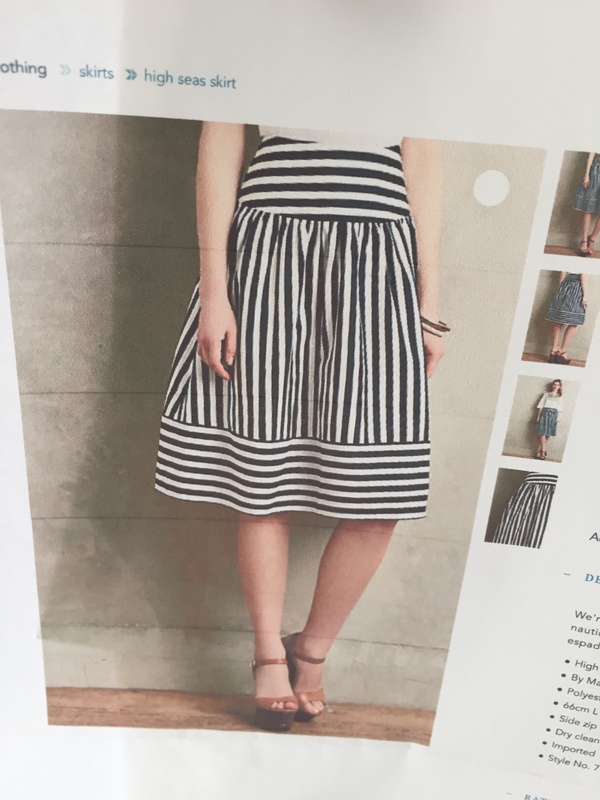 I had originally bought some striped cotton fabric from Ditto Fabrics to make a skirt inspired by this one from Anthropologie. Having realised what I actually need is more tops and dresses I decided to make a dress. I have more than enough stripy tops. 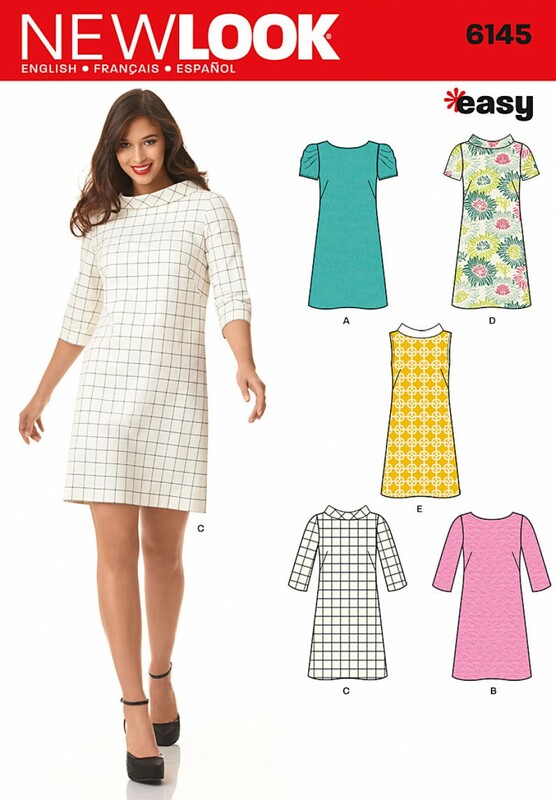 At that point I was planning another Esme dress (from this book) but having laid out the fabric I quickly spotted there wasn’t enough for sleeves! So the sleeveless Esme was born. I had cut already cut this out to take along to the first meeting of the new Chichester sewing group in case Karen and I actually had time to sew. We didn’t! There were too many people to talk to. However, when I came to start sewing on Friday evening the fact that it was already cut out, my sewing machine had been cleaned and a new needle fitted (so I didn’t show myself up in front of other sewists) meant this was a very speedy make. The machine was even threaded up with the right thread and a full bobbin. The only issue was the mess up I made binding the armholes with bias binding. I’ve disguised the untidy join with another piece of binding and I’m sure no-one will be inspecting my underarms that closely. I will get it right next time. The fabric had a tendency to fray so I decided to do French seams which I love because they are so neat and tidy. I also stays stitched the neckline as soon as I released the fabric from the pattern pieces as it felt like it could easily stretch out of shape. I did reference the original inspiration by cutting the pockets so the stripes run horizontally and this also made life a lot easier because I didn’t have to match the stripes. This is probably the most comfortable garment I own and I think I’ll be cutting out another one very soon before this beautiful weather disappears. I know the reason I’ve rejected the dresses from last year is because they are too loose – and so is this dress! I’m OK with that because (a) it fits at the neckline and shoulders and (b) it’s supposed to be like that! I’m also happy that this fabric doesn’t crease as much as I thought it would. I sat and melted in it all day and it still looked pretty fresh. I am feeling quite inspired and the sewing machine has come out of the loft already. Thanks for hosting – I enjoyed it so much. It’s given me the sewing kickstart I needed. 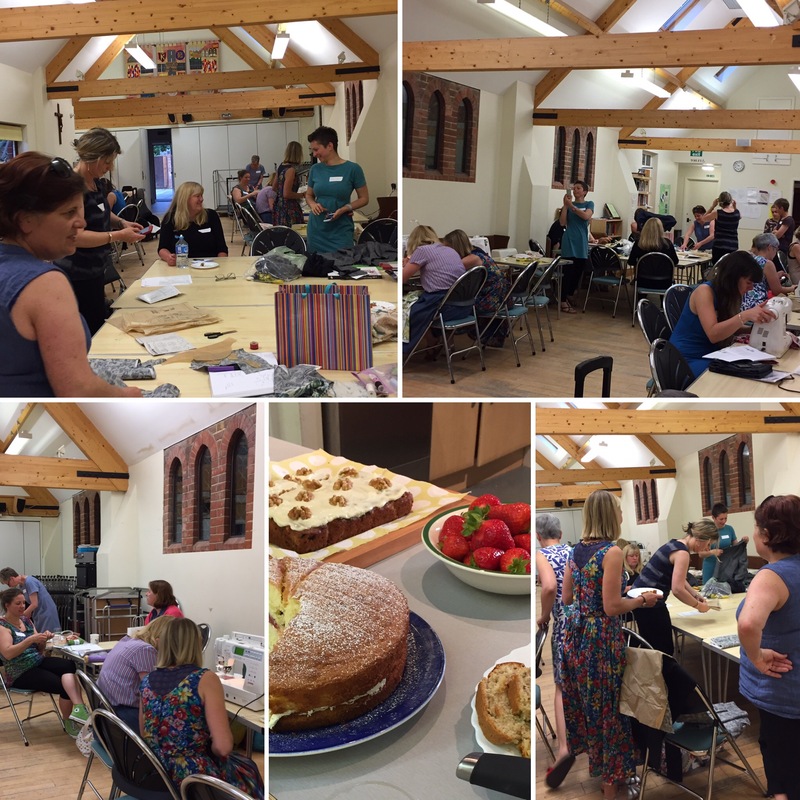 A fab evening of chatting, sewing, tea and cake. Met some really lovely people. I absolutely loved it …. Can’t wait for the next one! Karen The Draper’s Daughter and I thought we might be sitting by ourselves eating all the cake at the first meeting of the new Chichester sewing group, so Wednesday night’s turnout was nothing short of phenomenal! Thank you to everyone who came along and made the evening such a success. As you can see, the feedback we’ve had since has been really encouraging. Apart from my recent blog post and a couple of posts on IG we had kept it fairly low key so were pretty overwhelmed when 20 people arrived at the church hall! Sewists were arriving from about 6.30 – two people had driven over from Portsmouth – and they were still coming through the door with their sewing machines after 7.00 pm. Karen and I kicked off with a quick introduction explaining the outline plans for the group but making it clear that the future direction will be guided by everyone. Ideas were already flowing during the evening so I don’t think we’ll be stuck for activities. Individual introductions took a while but I’m afraid it was all a bit of a blur …. I think Karen and I were in a state of shock! There were several familiar faces, including old friends, as well as some virtual friends I only knew from IG. It was so good to finally meet Cathy from @cathysewsstuff. We’ve been following each other for ages and she was as lovely IRL as I knew she would be. It was also great to see Anna and Dhurata from The Eternal Maker. 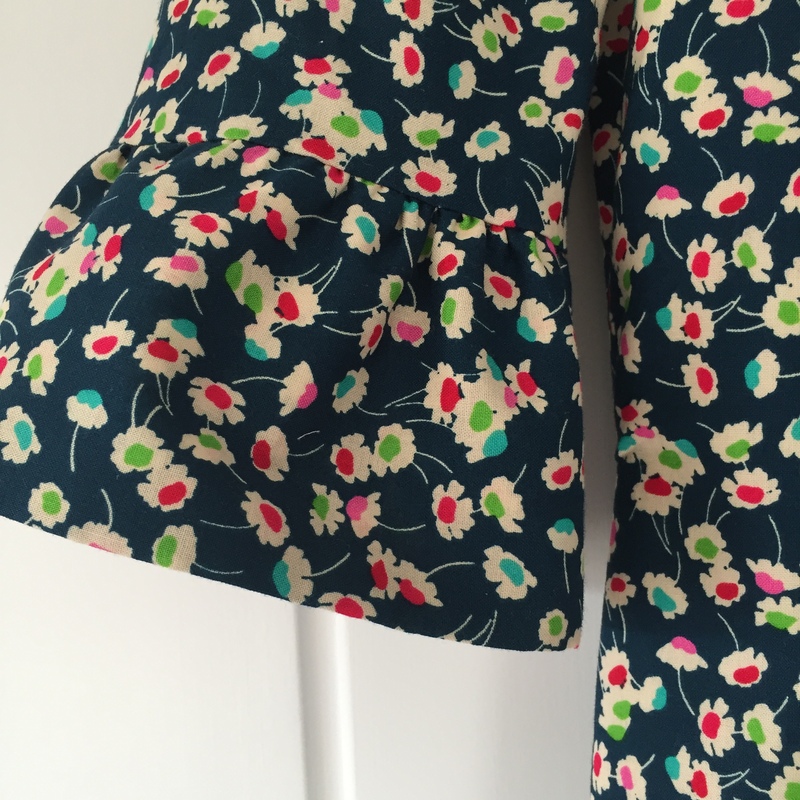 Anna will shortly be celebrating the 10th anniversary of her company and it was a dressmaking course there about seven years ago that encouraged me to start sewing my own clothes after years of only sewing bags, aprons and cushion covers. We didn’t think that much actual sewing would get done the first night but we were wrong! Once the introductions were over everyone got stuck in and the sewing machines were whirring. It was great to see people helping each other. My friend Sally received some expert advice from Cathy on altering a dress she’d brought along. This was the first dress she’d ever made and the fit was not quite right. 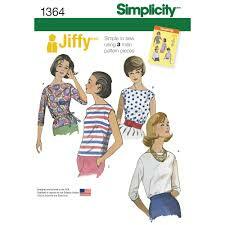 By the end of the evening she’d unpicked the sleeves, put in some new darts and is already planning her next make. With a little help from her friends another new sewist started and nearly finished a pillowcase dress to take on holiday. There were some lovely hand painted tea towels being hemmed for a gift, some people were cutting out new garments and there was also some crochet going on. Karen and I did absolutely no sewing! We had both cut something out to take along but we ended up speaking to everyone, making tea and cutting cake instead. There was A LOT of chatting going on in the hall, the atmosphere was amazing! I was very pleased that some of my ‘surplus to requirements’ fabric on the swap table found a good home, as did some patterns. In exchange I acquired this New Look pattern which I’m very pleased with as it’s one I’ve thought about buying in the past. There was also cake. My kitchen has been like the Bake Off recently what with birthday cupcakes and the sewing group. The beautiful Victoria Sandwich in the picture was made by Karen. Here’s some photographs of the evening which hopefully show just how busy it was! The next meet up will be on Wednesday 12 July, same time (7.00 – 9.00 pm) same place (St George’s Church Hall, Cleveland Road, Chichester). We’d love to see everyone back – and any new faces too. There will be a £5 charge each month to cover the cost of hiring the hall and refreshments and what’s left over will accumulate to pay for equipment, tutors, visits etc. We already have some ideas in the pipeline. We will launch straight into sewing next time and Karen and I will definitely get something stitched. Last but not least, a big thank you to Karen’s lovely daughter who came along to help. She shifted furniture, made tea and washed up. We couldn’t have managed without her. Baking is only a occasional event in my kitchen since the decision to reduce sugar and fat consumption in our lives but I do like to rustle up a batch of cupcakes for birthday celebrations. This is my go-to recipe for cupcakes which I thought I’d share because it is so quick and easy – no beating required, just stir liquid ingredients into dry ingredients, spoon into cases and bake. It was originally published in Good Food Magazine some years ago and I’ve used it many times. The cakes are lovely and moist and keep well. The white chocolate icing is also yummy and because it sets hard in the fridge there is less danger of it getting squashed during transportation. I used to pipe icing, I rarely bother any more! It was my mother’s birthday at the weekend so I made a batch on Saturday morning. I added fresh raspberries to the mix which worked really well – I used a 150g pack minus the 12 I saved to decorate the tops. I cut each one in half before stirring them in. I made sure each cake had some raspberry in it, although I wasn’t as diligent as my grandmother who used to ensure that every little cake contained exactly the same number of chocolate chips to avoid any argument! My sister and I sometimes picked them out to double check. A strong warning was issued to Mr Jane Makes NOT to eat any of the reserved raspberries before I had a chance to put them on the cakes! I also used freeze dried raspberry pieces on the top. You can find these in the baking section of most supermarkets and, not surprisingly, they taste just like raspberries! I might try fresh cherries next time – they would go well with the ground almonds in the cake mixture. It’s my birthday in the not too distant future and disappointment/displeasure is expressed in the office if cakes are not provided by whoever happens to be celebrating. This post is a bit late but we were away last week. Here’s what I wore for the second half of the month. I think it’s safe to say I have plenty of skirts! The one I’m wearing on Day 17 was altered after Day 4 and is now a much better fit. Everything I’ve worn here will be staying in the wardrobe – even the Mandy Boat-T which seems have grown considerably wider since I made it! There were a few casualties that were tried on and rejected. Some have made it to the alterations pile, others are heading for the charity shop. I’m determined to have a more streamlined wardrobe going forward. Update from yesterday on something I thought about this morning …. One of the things I’m particularly sad about is that this Laurel Dress made in a lovely Liberty fabric now swamps me and I’m not sure I’ve got the time/patience to dismantle and alter it. I also decided this morning that I still don’t have enough tops. I think my favourites from the second half of the month have to be the blue and white fish skirt (a curtain fabric remnant), my two Gable tops from Days 29 and 31 (also worn on Day 17) and my Merchant and Mills Top 64 from Day 30 which I wore while we were camping at the Hay Festival. The fabric doesn’t crease whatever you do – even when you fall asleep in your tent in the afternoon! I was particularly pleased when I was packing for our trip on Day 27 to find my pile of ironing was almost exclusively made up of me-made and charity shop clothes. Another great Me-Made-May which has once again focused my thoughts on what I make and wear. I’ve also really enjoyed seeing everyone else’s posts throughout the month. A big thank you to Zoe for this inspiring challenge. I always feel a bit lost at the beginning of June without the focus of my daily photo!